Cross-pollination refers to the pollination of female flowers with the pollen from a male flower. Many situations arise in which the hand-pollination of flowers is beneficial. A gardener may simply wish to make sure that a certain variety remains pure. Gardeners often use cross-pollination to create hybrid flowers, fruits and vegetables that exhibit a desired mix of traits. Cross-pollination can take place in an open garden or in a greenhouse situation with the same results. Examine the plant to be pollinated. Male flowers will appear on a plant first and in larger numbers than female flowers. The male flower contains a stamen which has pollen. Female flowers have a small knob at the base of the flower which indicates a baby fruit or vegetable. Inside of the female flower petals, the stigma receives the pollen. Collect pollen from a male flower with a cotton swab. The ideal time to collect and transfer pollen is on the first day the female flower is open. The color of the pollen depends on the type of flower. Collect as much of the pollen as possible on the head of the cotton swab by brushing the cotton swab onto the stamen. The powdery substance that clings to the end of the cotton swab is pollen. Transfer the pollen from the swab to the female flower, stroking all areas of the stigma. Rub the cotton swab all over the stigma. It is not necessary to measure how much pollen is transferred to the female flower. 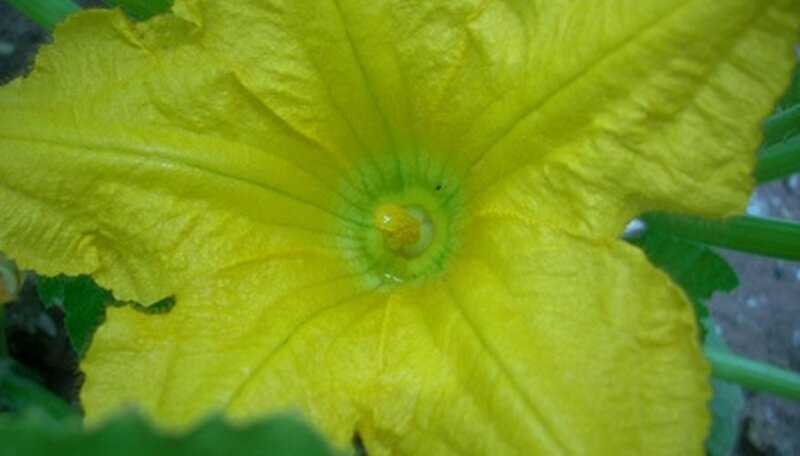 Tie close larger flowers, such as squash or zucchini, with a small piece of twine. Smaller flowers can be loosely covered with a plastic bag that is secured with a twist tie. This prevents the transfer of pollen from another source through insect or wind, keeping the resulting pollination pure to the female and the male. Use a label to identify the hybrid mix if cross pollination is between two different varieties. In indoor greenhouse situations, it isn't necessary to tie flowers or bag flowers if you are not creating a hybrid mix. There are usually no insects in a greenhouse to pollinate flowers. The cross pollination worked if after a few days, the female flower falls off, leaving a growing fruit or vegetable. Cross pollinate in early morning as female flowers close during the afternoon.